Ola Niñahttps://olanina.wordpress.comTwo Australian girls who met whilst traveling in Spain, we bonded over our love of throwing tomatos (La Tomatina) and Surfing...this is how Ola Niña was born! Are you a bit over having porridge or toast for breakfast? 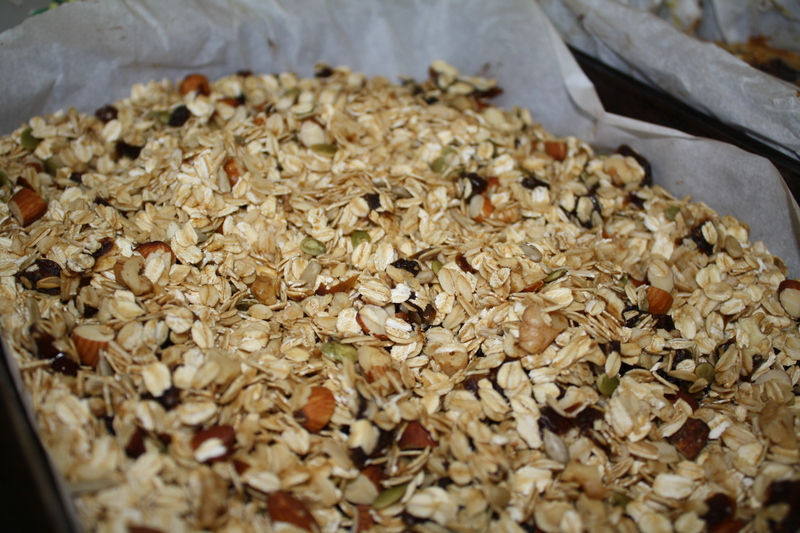 instead of opting for a cereal with a high sugar content, why not try our simple and delicious homemade muesli. It will take you 10 minutes to make, will last weeks in a container or glass jar and the best thing is you know exactly whats in it! Preheat oven to 175c. Using a fairly deep and long baking tray, spread enough baking paper to cover the bottom of the tray. Pour the bag of oats onto the paper and spread them out. Scatter all the nuts onto the oats and using a spoon combine the mixture well. Cut the dates up into small pieces and scatter throughout mixture. Pour the coconut oil throughout the mixture and drizzle enough honey over the mixture until most of the top layer is covered. Using a spoon, mix all the ingredients once again before putting into the oven. After five minutes stir the mixture again and pop back into the oven for a further three minutes or so. Let the muesli cool and then serve with natural yogurt, cinnamon and either shredded apple or some strawberries. YUMMO! Enjoy! 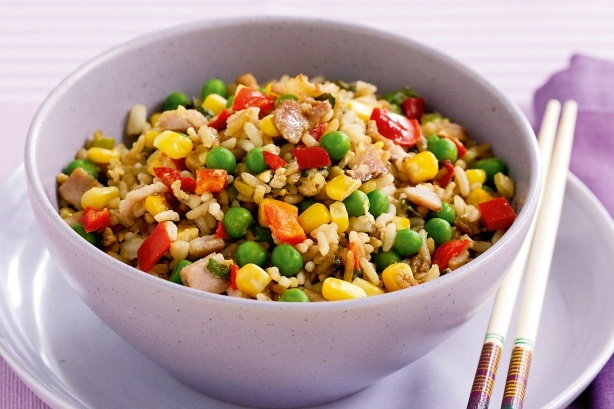 Fried Rice is a favourite go-to recipe. I’ve put down a basic recipe here but feel free to use whatever vegetables you like. If you are vegetarian, lightly fried tofu is a great replacement for the bacon and egg. I like to add any left over veggies as well to mix it up! Step 1 – Add rice and water to a pot and cook until el dente. Drain. Step 2 – Heat oil in a wok or frying pan over medium-high heat. Swirl to coat. Add bacon and onion. Stir-fry for 2 to 3 minutes or until bacon is golden and crisp. Step 3 – Add peas, corn and capsicum. Stir-fry for 1 minute. Add egg. Stir-fry for 1 minute or until egg is cooked. Add rice and kecap manis. Stir-fry for 2 to 3 minutes or until heated through. Spoon into bowls. 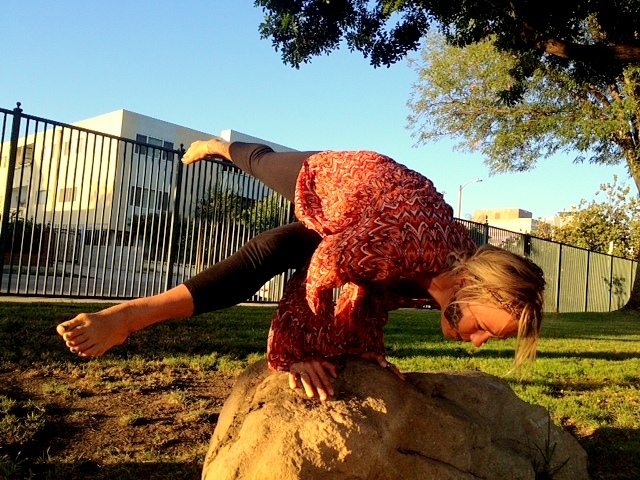 Our resident Yogi, India Reinartz, has some awesome tips to help keep you healthy, happy and wise. 1) drink lots of water – drink as much as you can! 2) Keep your attitude positive – don’t let negative energy bring you down. 3) Live on the edge and get a little crazy – we all need to let our hair down and keeping your lifestyle balanced is key! 4) Eat a balanced diet, don’t skip meals. Learn to understand what your body needs to eat for nourishment. 5) Take rest and use your creative energy in whatever way you can. Feed your mind with wonderful stimulation and your positivity will flow! Sunshine Coast shredder Tarnea O’Meara may only be 19 years old but she is already turning heads out in the line up with her mature and impressive style. The young, blonde bombshell has a passion for the outdoors, but her favourtie things to do are hiking mountains and surfing solid waves in Australia and exotic destinations overseas. She’s got a happy-go-lucky attitude and loves nothing more than the coastline she calls home. Tarnea recently spoke with Ola Nina to explain what it is about surfing she just can’t get enough of…. What age did you start? I started surfing when I was 16. Before that, my dad tried to put me on a board when I was young but I didn’t like it. Now I can’t get enough of it! I love the feeling it gives you, whether you get the best barrel, or make the best turn, you are always stoked for the people you are with or the wave you just got. It’s a sport that changes every day you can never surf the same wave so it keeps you on your toes ready for the next one. It’s also my form of exercise instead of paying for the gym, I’ll go surfing! Do you have any sponsors at the moment or have you been approached by any? Right now I am with a small clothing company called Rue Stiic and a health food and information company called Changing Habits. But I am always seeking out sponsors to help me and for me to help them. It’s always nice to have that extra support from them, every little bit counts. Where are your favourite places to surf? Anywhere where there’s not a crowd but if I had to choose, Durranbah, Canggu, Ulluwatu and home. There is nothing like surfing at home along the coast line like the Noosa Points all the way to Wurtulla. What board are you riding? I’m riding Hammo (Dane Hamilton) surfboards right now and I love them. Dane really helps me with my boards and what’s right for me. They range from a 5’5 to 5’7. Do you have any other hobbies other than surfing? Food if that counts, scuba diving, music, dancing (not the class or choreographed type), being weird and snowboarding. If I’m not near a beach, I’m up in the mountains. 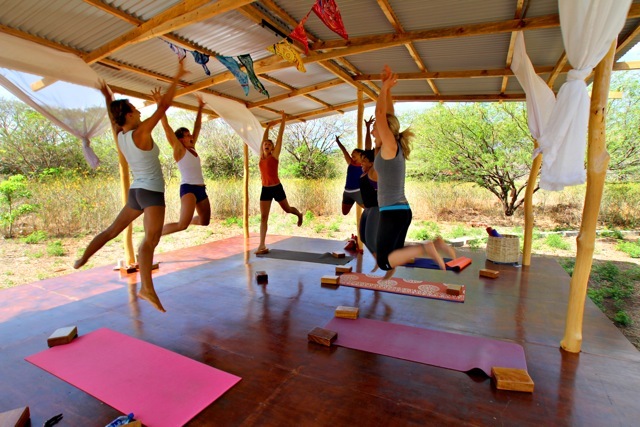 Yoga and Surf Retreats in Nicaragua! 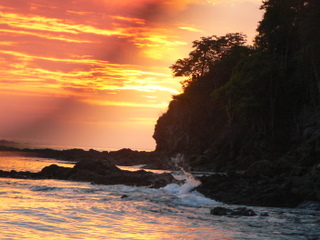 If you are thinking about making a surf trip, we highly recommed the sunny shores of Nicaragua in Central America. We travelled to Playa Gigante and found some incredible waves and some even more wonderful people. Our lovely friends at Papaya Wellness have some incredible retreats available, if you want to get away, eat healthy, surf and practice yoga everyday. 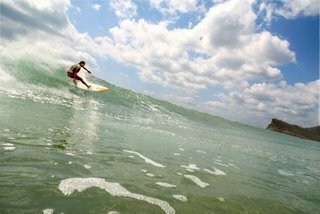 Their all inclusive retreats will immerse you in mindful, recharging yoga and challenge you in the epic Nicaraguan surf. They’ve done all the work in the beautiful coastal town, to ensure that you will have nothing to worry about except having the most relaxing, healthy, fun and inspiring vacation! They offer all inclusive retreats to accommodate your needs for relaxation, rejuvenation and enjoyment, including airport transport, healthy detoxing meals, and a variety of yoga classes and surf sessions to keep you motivated and fulfilled. Papaya Wellness will take care of you for 7 days, with no worries! Papaya Wellness also runs a variety of community projects that you can get involved in. They also have a regular yoga and fitness class schedule, so even if you don’t make a retreat, you can always surf and practice yoga in your own time! As far as we are concerned, these retreats are 10/10. The location, the incredibly delicious healthy meals and the wonderful team at Papaya Wellness, make these retreats extra special. Whether you are looking to improve your surfing, your yoga practice or both, you will leave rejuvenated and feeling empowered. This delicious recipe is a healthy dinner option and tastes amazing! Step 1 – Whisk the soy sauce and kecap manis together in a jug. 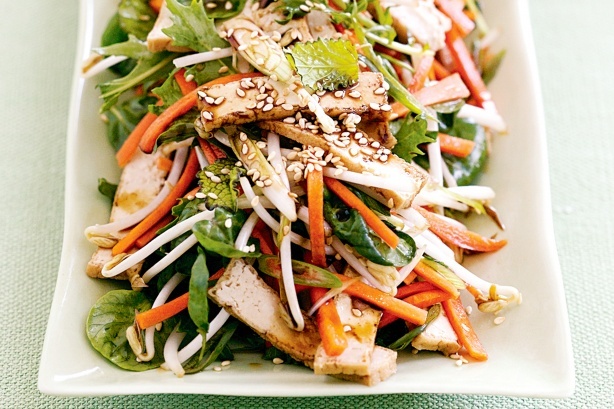 Step 2 – Combine carrot, tofu, beansprouts, onion and salad greens in a bowl. Drizzle with kecap manis mixture. Sprinkle with sesame seeds. Serve, eat and enjoy! 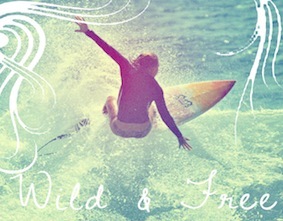 Our resident surfer babe from Nicaragua (India Reinartz) shares some of her key tips to staying surf fit and healthy! 1) Cardio – interval cardio training will help with fast reaction time. 2) Core strength – great moves are the plank pose, oblique and abs work outs and pilates! 3) Flexibility – overall, it’ll help with your movement in the water and will help you prevent injuries. 4) Continue swimming when you aren’t surfing to help with cross training to help maintain your paddle power. 5) Swim under water laps to maintain good lung control and help you keep calm under pressure. 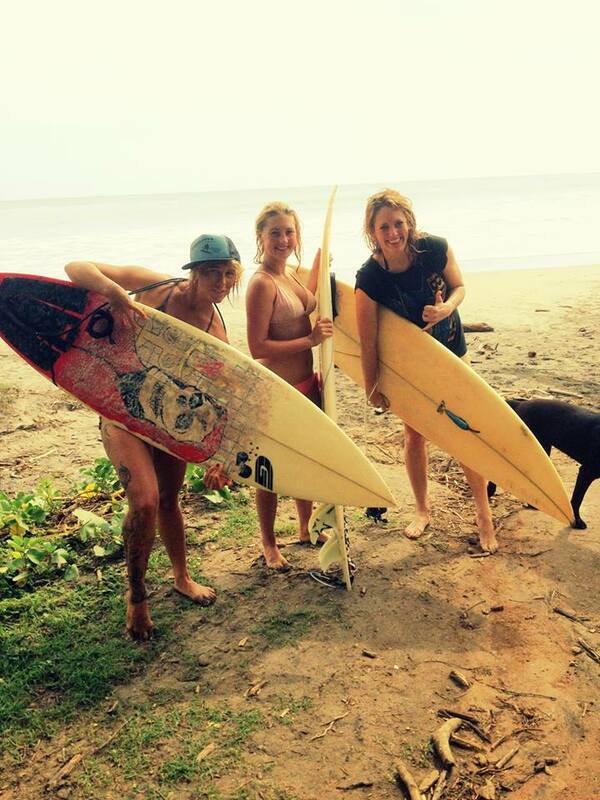 You can read more about India and her amazing surf/wellness retreats in Nicaragua, in her interview! Originally from Victoria, Alison is someone who was very new to the world of surfing until her discovery of the sport two years ago. A Geelong girl through and through, her love of surfing came to her when she moved further north to the Sunshine Coast in Queensland. 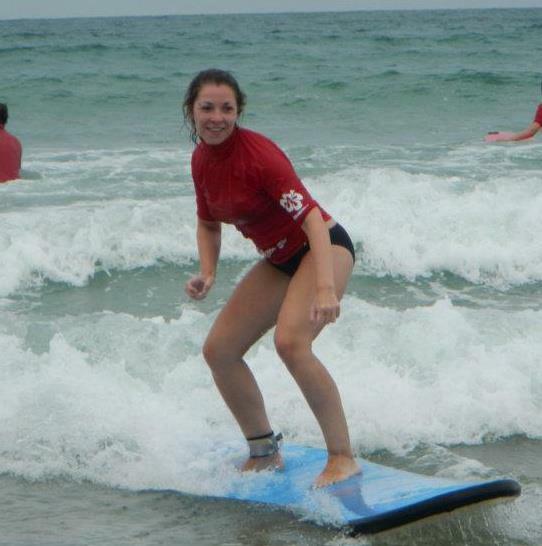 The move into a warmer climate and a popular surf culture inspired Alison to give surfing a go. “I start surfing two years ago,” she said. 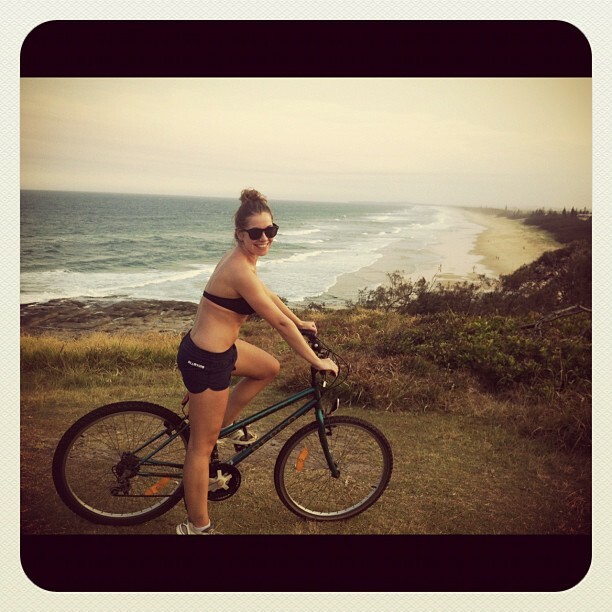 “The first time I surfed was at Noosa Heads while on a lesson with three close friends. Following on from her first lesson, Alison was so ‘surf hooked’ that she decided to dedicate practicing her surfing skills just about every weekend. “I eventually purchased my own board (mini mal 7 foot 4),” she said. Looking back on her transition, Alison says her move to the Sunshine Coast has opened her up to new things especially her new found love of surfing. “I think my favourite time of year to surf would have to be spring, the waters clear and it starts to get warmer,” she said. Some of Alison’s other hobbies include dancing, exercising, eating out, travelling and reading. 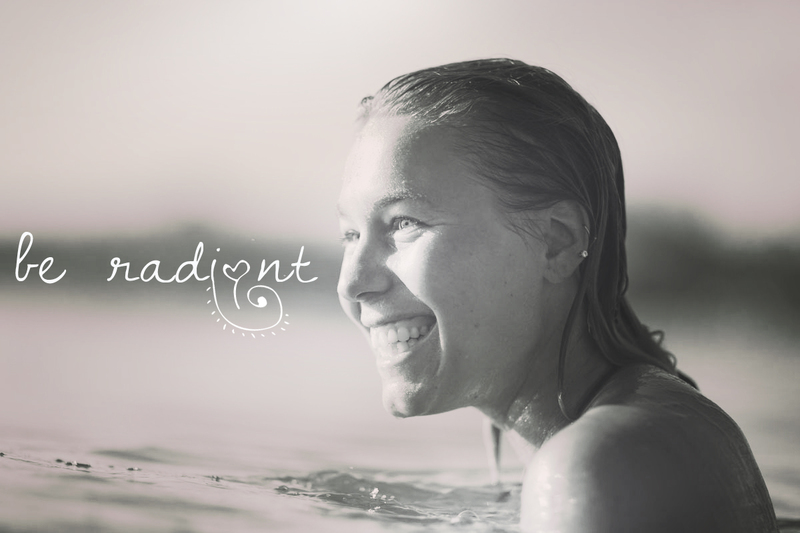 As a surfer and yoga instructor, India Rineartz is passionate about health and wellness. She’s going to be joining us on Ola Niña to share her tips on how we can live, eat and surf better. It is here, in this beautiful setting, that India and her friend Carly started their wellness center, Papaya Wellness, 2 years ago. As well as running regular yoga classes and yoga/surf retreats, the girls spend time working with the local community. “We educate the local women on health and exercise. We run fitness and yoga classes weekly, which are free of cost. We run health workshops a few times a year to educate the village women about balanced diets using healthy local produce”. India believes that education is the best way for local women and their children to maintain good health in years to come. After living in Nicaragua for 5 years, India has seen a lot of change. When she isn’t teaching yoga or motivating the local ladies in a cross fit class, India is surfing. “My favorite break here is Colorado’s (a chunky beach break) because it’s constantly challenging me. It’s always pitching me over the falls no matter how confident I am. It’s very humbling”. Despite being known as one of Playa Gigante’s best female surfers, India didn’t grow up surfing. She was born in Jamaica and later moved with her parents to Canada, where she grew up and went to school. She caught her first wave at the age of 15. “After that, I would surf the south island, close to Victoria every weekend, with some for my best girl friends. We had little surfer girl posse, we called ourselves the Blue Crushing It Team. [Laughs]”. Part of the reason India now teaches yoga is because she feels that surfing and yoga create a similar peace of mind. It’s also the reason she now runs her own wellness center. When it comes to how she feels right now, India is a bundle of positivity. Her love of surfing, yoga and health have given her focus to keep creating positive change in rural Nicaragua through the things she loves. Apart from being a ripping surfer and a yoga goddess, India is just generally an enjoyable person to be around. We hope you enjoy her input into Ola Niña and that you can one day make it to Nicaragua to surf with her and the other women at Playa Gigante!